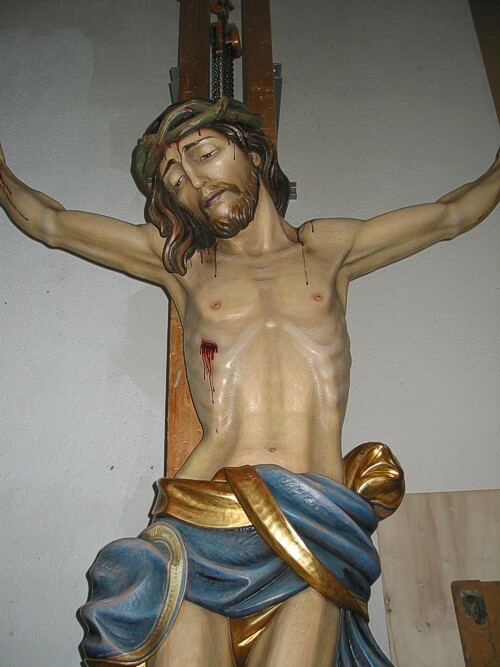 Home > Blog > Original carved wood crucifix for Holy Family Church in Hilton Head, S.C. 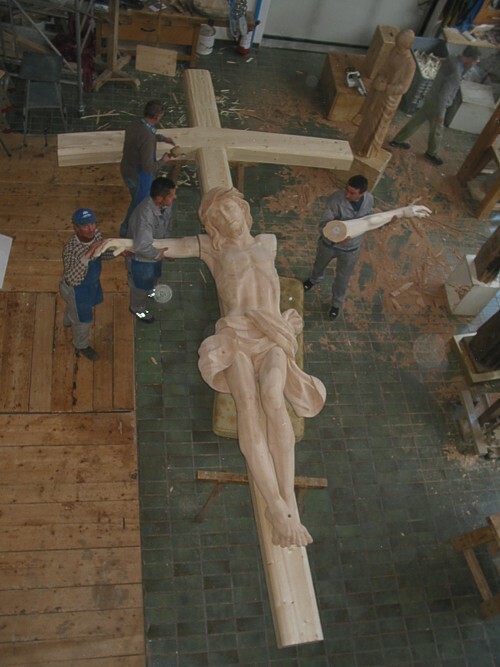 Original carved wood crucifix for Holy Family Church in Hilton Head, S.C.
Mazzonlini Artcraft worked with our partner Art Studio Demetz of Italy on an original, carved wood crucifix for Holy Family Catholic Church in Hilton Head, South Carolina. 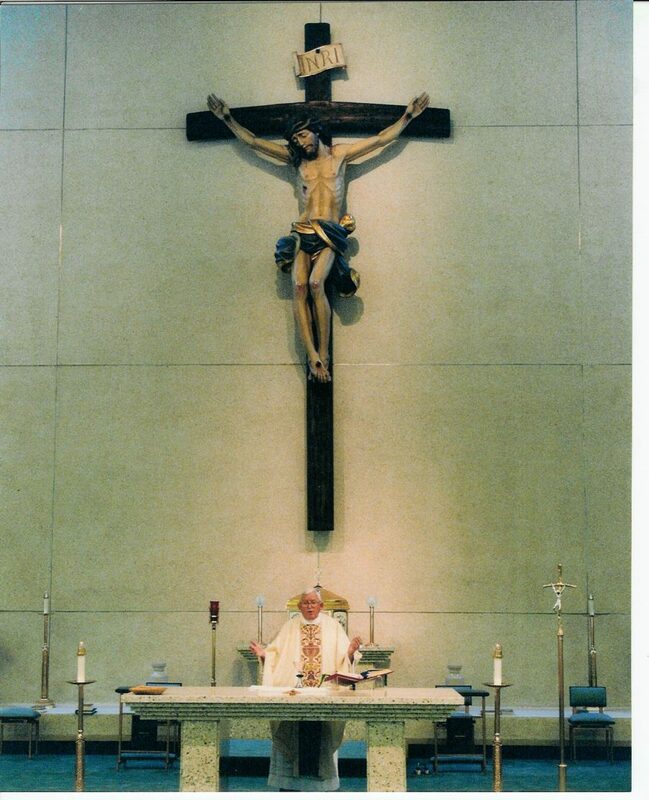 The corpus is 10 feet tall, and the crucifix is 20 feet and weighs about 1,000 pounds. Hanging above the altar, it’s a striking sight. Demetz has been designing stunning religious artifacts for centuries, employing artists and craftsmen of the highest order. 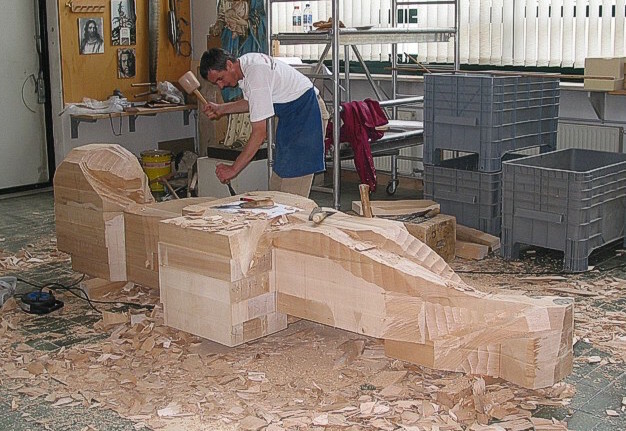 Wood sculptors sometimes use chainsaws in the early stages, but also use many of the same tools that were used hundreds of years ago. Woodcarvings are valuable for their timeless beauty, becoming more precious with age. The character of wood is always preserved, whether left in its natural state or lightly finished in oil colors. Wood is still a “living” material, and small cracks or splits can result from temperature changes and humidity. 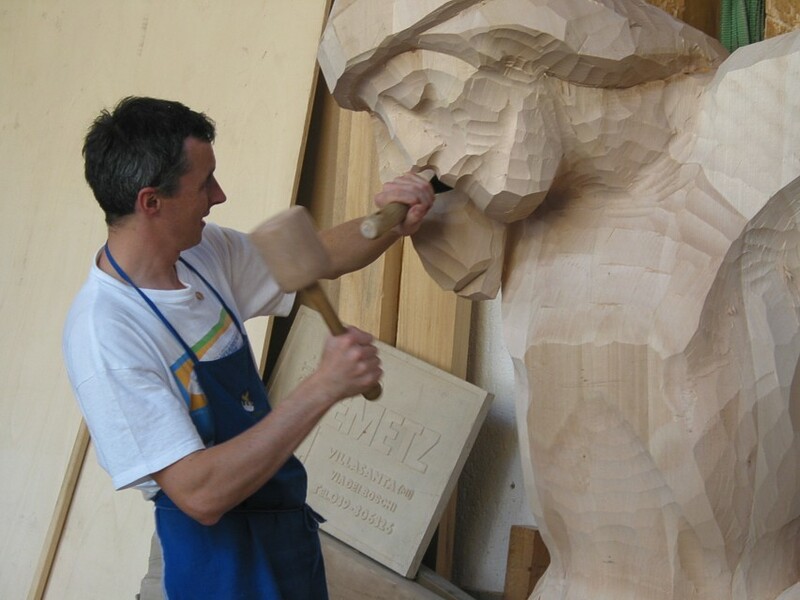 Demetz uses wood from Linden trees imported from Eastern Europe. It’s not too hard, fairly white in color and doesn’t crack as much as pine does when dry. The cloth Christ is wearing has been rendered in the Baroque style, which is more common in European statues. 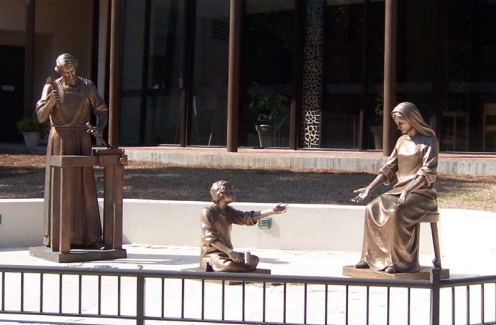 Mazzolini and Demetz also provided three original bronze statues of a young Jesus, Mary and Joseph for a shrine outside the church. Both the shrine and the crucifix are featured in the guide for a walking tour of the Holy Family Church and grounds. 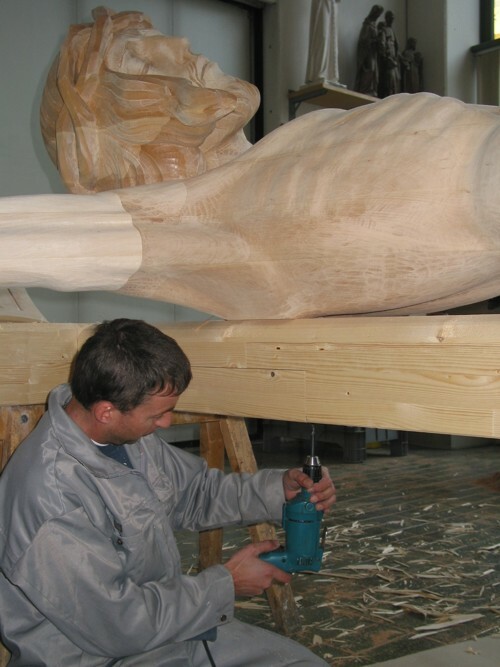 The photos below show some of the stages in the process of carving, painting and mounting the corpus. 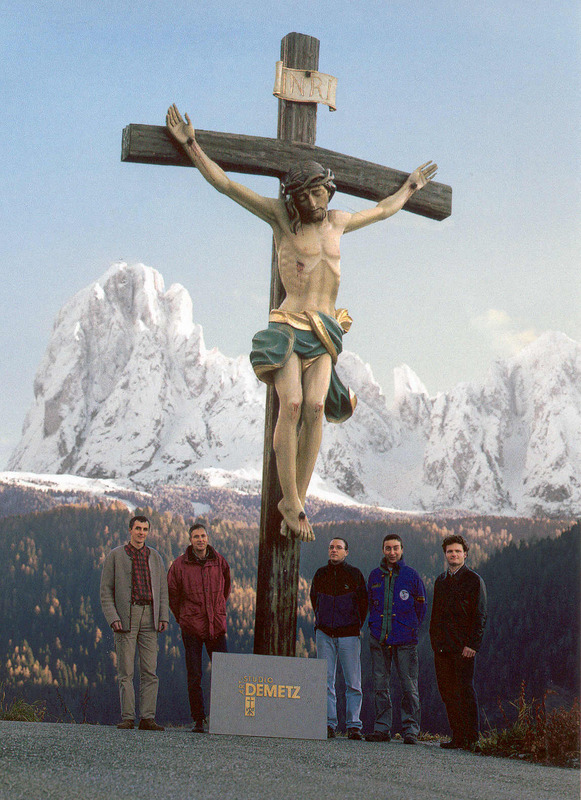 The artists pose with the finished crucifix outside the Demetz studio, prior to packing it for shipping to the U.S.